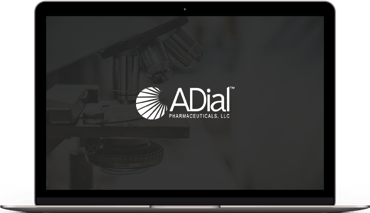 Adial Pharmaceuticals, Inc. ("the Company") is a clinical-stage biopharmaceutical company focused on the development of a therapeutic agent for the treatment of alcohol use disorder ("AUD") using its lead investigational new drug product, AD04, a selective serotonin-3 antagonist (i.e., a "5-HT3 antagonist"). The active ingredient in AD04 is ondansetron, the active ingredient in Zofran®, an approved drug for treating nausea and emesis. AUD is characterized by an urge to consume alcohol and an inability to control the levels of consumption. The Company intends to commence a Phase 3 clinical trial using AD04 for the potential treatment of AUD in subjects with certain target genotypes. The Company believes this approach is unique in that it targets the serotonin system and individualizes the treatment of AUD, through the use of genetic screening. The Company has created an investigational companion diagnostic biomarker test for the genetic screening of patients with certain biomarkers that, as reported in the American Journal of Psychiatry (Johnson, et. al. 2011 & 2013), are believed will benefit from treatment with AD04. The Company's strategy is to integrate the pre-treatment genetic screening into AD04's label to create a patient-specific treatment in one integrated therapeutic offering. The Company's goal is to develop a genetically targeted, effective and safe product candidate to treat AUD that does not require abstinence as part of treatment.